Tonight was the Board’s Ad Hoc Committee on Student Assignment meeting to consider the latest iteration of the Superintendent’s proposal for middle school assignment. The staff presentation was informative, and did a good job of mapping the Board’s original goals for student assignment to the current middle school assignment proposal. So now, it’s up to the Board. This is a tough one, because in some sense, everyone is right. We’ve heard strong objections from the Parent Advisory Council and Parents for Public Schools, objections that are centered around equity and the feedback from many parents that they would rather choose a school that works for their child than have that school chosen for them. At the same time, we’ve heard increasingly more logical arguments from staff that there are good systemic reasons to curtail choice and instead work on building up programs that parents all over the City say they want. Quite honestly, from my perspective it’s a little like trying to put together a puzzle where all the pieces are the same size and shape, but make a very different picture depending on how they are strung together. It sounds a little simplistic, but I’m thinking the best way to approach this decision is to make a pro and con list to consider. Predictability. Some parents have long argued for predictability in school assignments, and predictability was one of the factors I pledged to uphold when I ran for the Board. However, predictability for parents is just one puzzle piece, and the PPS/PAC reports have argued that it is not as high on the list for parents as other priorities for school assignment. Still, principals and district administrators have made strong arguments in favor of an assignment system that allows them to better plan and tailor their programs for the students who will enroll in them. Tonight, staff pointed out that many of our middle schools are currently receiving students from 40-50 elementary schools – each of them offering different experiences and attracting vastly different students. If they could focus on 10-15 elementary schools, the MS principals say, they could do a better job tailoring their programs and serving students. 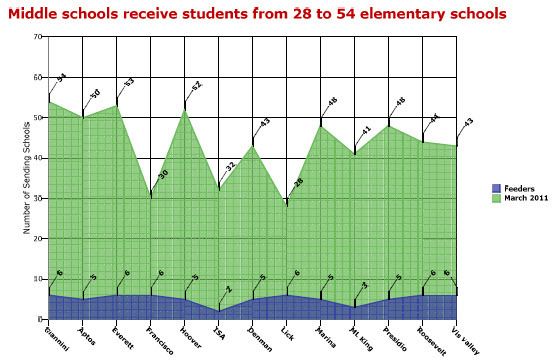 From that perspective, it’s no wonder that MS principals voted unanimously to urge the Board to adopt feeder patterns. 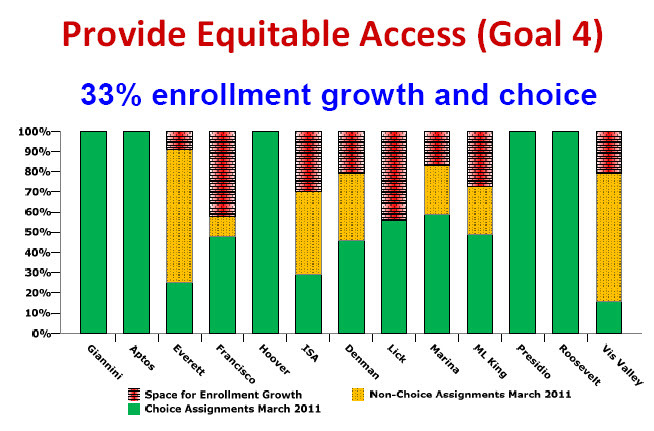 Equalizing enrollment. I think the boldest statement in tonight’s staff presentation was “with enrollment comes resources.” The biggest capacity, highest enrollment middle schools are all on the West side of the city. When you have 1,000+ students (Hoover, Giannini, Presidio), you can offer a lot of electives like visual arts, band, language and other extras; you can also offer courses geared specifically for students of different academic prepartion. When you have a few hundred students (Visitacion Valley, Everett, ISA), it’s pretty hard to offer the same breadth of courses. Equalizing the enrollment of our middle schools will make a big difference for under-enrolled schools’ ability to offer the courses that parents and students say they want. A storm’s a comin’. Based on several different models created by our demographers, we’re looking at a significant increase in middle school enrollment over the next decade (33 percent between 2010 and 2020). The days when “most people get what they want” in the middle school choice process (excepting the 15 percent or so who don’t) are over. This slide from tonight’s presentation was, in my opinion, the most persuasive on that point. All of the five most requested middle schools are at capacity; there is no more room at those schools and any excess capacity is going to have to come from schools that are less requested. Whatever plan the district adopts, if the forecasts for excess capacity are accurate, more and more families will find themselves assigned to schools they do not want and did not choose. Inequities. It’s not even debatable — there are clear inequities between programs at some middle schools compared to others. Some of that is due to lower enrollments at some schools vs. others (see “equalizing enrollments,” above); some school leaders say they are philosophically against providing programs that prospective parents want (e.g., separate honors tracks). Broken promises. Students in language programs were promised pathways through high school. Can the district really deliver on that promise given the budget situation? Can it promise students both immersion AND electives in middle school? The district should be honest with families if it is going to require trade-offs (language immersion vs. electives, for example) in middle school. Why is curtailing parent choice the only way to build quality middle schools? Many parents don’t understand why they have to give up something (having an equal chance to attend a school of choice) in order to help the district build quality middle schools. Why should parents trust that the district will build quality middle schools in every part of the City when that has not happened up till now? Transportation and program placement. The district says the feeder plan will allow more rational transportation planning and program placement across the district. But students will need those buses/programs starting next year. Why should we trust you that buses or programs will be in place as soon as they are needed? I’d like to know your sense of the pros and cons of the current proposal – if you support it, what do you think the downsides are? If you are against it, where are the positives in the proposal? Let me know in the comments. This entry was posted in student assignment and tagged middle schools, recap. Bookmark the permalink. actually, we tax payers don’t spend much money paying “the Board” for their work. They are volunteers for the most part. Seriously, in the end there may be for some Board members an ulterior motive for joining the Board, but while they are there they do not take much of your money away – YET. Until they are salaried members of the Government, as proposed by the Board of Supervisors, I don’t think you can complain about the time they have spent on this project. The ultimate goal is to improve the schools. We have many more kids enrolling in kinder this year. I was surprised to see that my child’s school has 23 extra kids this year, and very few other schools were less enrolled this coming school year. How easy is it for a group of people to focus on this work when it is not their full time job? I think this is part of the problem. This is SUCH a waste of time and taxpayers money that it is absurd! Spend your time and the little resources and money available to improving all the schools FIRST. How much money and time has been spent on this “plan” already? The large majority of parents are against it. So we pay the Board to talk and talk and talk and talk, but do nothing that will actually improve the schools… Great… Homeschooling here we come. Sorry–I meant the Bret Harte Spanish pathway kids should still go to Lick, and perhaps the GE kids might be sent to A.P.Giannini along with Drew to increase the concentration and support for the AA population in that school–IF there is a school bus from the Bayview, which there should be in that case. I commented a few days ago, but I wanted to say a little more about commutes. This is one of those issues where the devil is in the details, and it needs to be through very carefully. All this staff time this year–why aren’t we seeing documents addressing these nitty-gritty ssues that parents care about?–time and safety issues in transport, and curricular issues such as honors and arts? I don’t think any middle schooler should be commuting an hour by MUNI (ie 2 hours round trip). Somewhere around 30m or 35m is fine; 40m is okay; and 45m is pushing it. Very little has been said about what will be offered families whose kids are being asked to go long distances (I’m assuming that we can only draw these times from feeder ES to the MS, not from where parents actually live, which in the case of some schools such as Clarendon may be very far indeed from the ES). Will buses be offered to Starr King and Carver kids, and to the kids from Drew? Also, if commute times are the reason why the west side schools are so walled off in the current map, I think the planners should look again. Even from Presidio way out on 30th Avenue, it is only 32m to Marina School, and even less from Roosevelt. It is only 30m from Redding to Presidio, and John Muir can go to Marina taking a one bus ride along Fillmore. Jefferson can easily get to Everett on the N-train or various buses. To address the equity question, a lot more should be done to mix up the schools. As long as MUNI commutes are held to 30m or 40m at the most, it should be fair game. If Monroe kids can be asked to commute to Hoover (40m or so, 2 buses), why not the others? There needs to be much more mixing, and that means that some of the west side schools need to be asked to commute east as well as east side schools west. I think what happened in the 2nd round of drawing the map was that so much attention was paid to language pathways that the equity issue was overlooked and made worse. I thought the first map should have been improved based on equity considerations, but the second map was worse! One thing this would mean is splitting up language communities within elementary schools. For example, GE kids from Lick could go to Marina and Spanish pathway kids to Everett (or Lick). Chinese pathway kids from Monroe could go to Hoover and Spanish pathway kids to Lick. It’s not ideal in terms of keeping the whole community together, but frankly, that’s okay. You’ll still have a high level of predictability, and a fair number of families moving as a group. What you gain is an ability to articulate language programs at fewer sites, which is much more realistic and strong in terms of staff and curricular resources. You have an easier time addressing the language versus arts electives question and how to handle it at each site, as you are concentrating families that are committed to that language pathway. For example, you could send the Mandarin families to a Chinese program at Hoover or even Denman, along with Chinese pathway families from Monroe and other schools in the Excelsior. And the GE kids from Starr King and Jose Ortega could be sent to Aptos along with GE kids from Sunnyside and Glen Park (sending Spanish pathway kids over to Lick). Eventually, the Bret Harte Spanish pathway kids should go to Lick, not A.P. Giannini. Finally, very important, you gain an ability to re-think the equity issues. The current map is a plan for more segregation, not less. I have read all the pro and con feeder arguments, and although I have been a skeptic, I see how several of the points make a lot of sense. But that doesn’t mean the current map makes sense! Rachel and other board members, I urge you to separate the “feeders: yes or no” question from the vote on the map as it stands. I thought the BOE told staff to re-think the current map, particularly with regard to equity (I believe this came from Jill Wynns, but the rest of you didn’t disagree). Why didn’t the staff revise the map, at all? Or get down into explaining the details of commutes and curriculum? All of these things need to happen before you agree to the final map. Parents care about curriculum and commutes. So talk to the parents about these issues! Otherwise, the current map makes no sense. 1) Lets families move as a community to a middle school, allowing us to feel like we’re not going it alone. This is especially important if the target middle school is one that requires a leap of faith. 2) Engages parents in the process of creating quality middle schools by encouraging them to speak out and pitch in for what they value (honors, band, etc). This process can start years before their child even attends the target school. The current system encourages “shopping” for the “best” school to which parents all flock. 1) Removes the fiction of “choice”. With “choice” parents think they will be able to choose their child’s middle school and live under this delusion until they receive their assignment letter. This means they don’t have time to raise political opposition, threaten the district with lawsuits, promise to find a candidate to replace you, etc. In other words, the choice game keeps people from knowing they are “losers” in the Aptos/Giannini/Hoover/Presidio lottery until it’s too late.